Yesterday I had my first experience shooting long exposure with my Lee Big Stopper filter. Made all kinds of mistakes and forgot some stuff but some helpful advice put me back on track to try again today. High tide was around 10.30am so headed out around 11am to Shag Rock, an iconic pile of rocks by the entrance to the Estuary. There are blurry people shots on the right that I haven’t bothered removing in PS so you can see what they look like, I think it would be fairly easy to tidy them up tho. Experimented with different exposure times, and I also used Bulb Mode this time. Neat trick with the 7D mk ii is that the Bulb Mode now has a timer, so you set the timer for how long you want and then press the shutter. NO NEED TO HOLD IT DOWN OR HAVE A REMOTE!!! I knew the camera could do it but forgot yesterday what the function was that did it LOL – thanks to nzsnapper for the reminder. Spent time playing with different exposure times – 15 -20 seconds seemed to be the best option, more than that and the highlights in the sky and on the water were blown out – yay for blinkies! 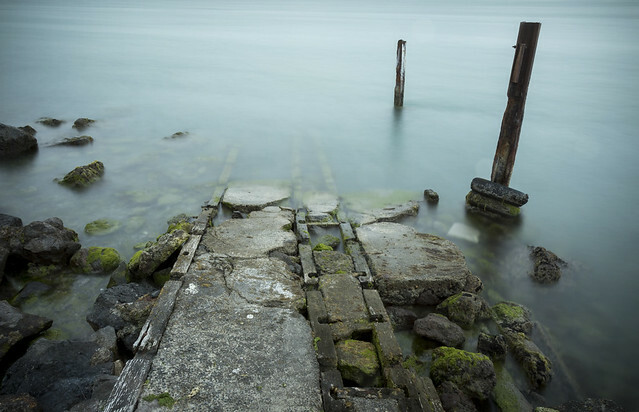 This is a much darker process than I usually do, but to me it worked better and I really liked how you still see the details of the rocks under the water close to the jetty. Wanted an angle that didn’t have all the distracting houses in the background, so put the tripod up high for this shot. 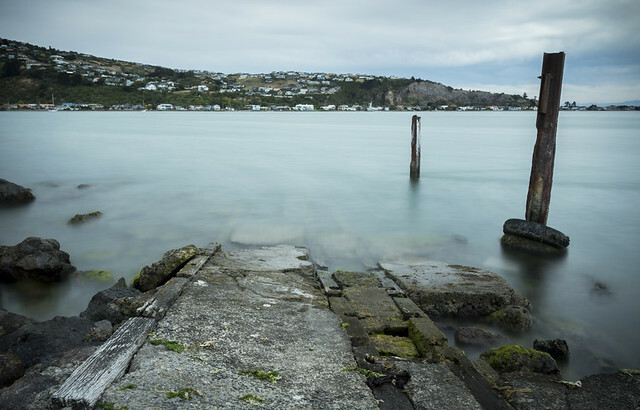 I like there is still texture and detail in the water and you can see the submerged rocks around the jetty. It looks like my filter does have a bit of a blue tint but changing the WB in LR to Cloudy seems to cancel it out fairly well. 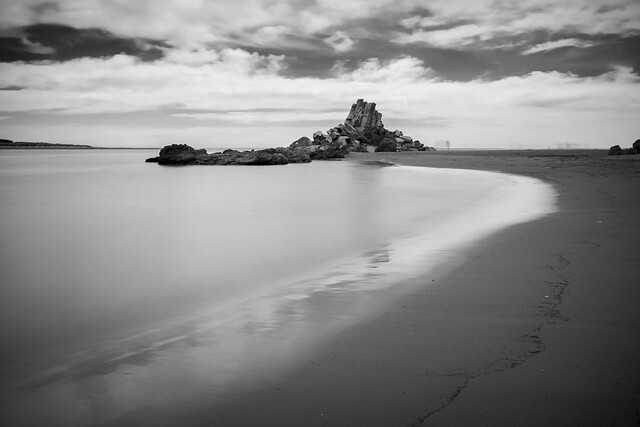 All images shot with 7D mk ii, 17-55 IS lens and tripod with Big Stopper filter. This time I had more fun experimenting because with the Bulb Mode feature I had more control and the location was more challenging. Still plenty to learn so comments, tips, ideas and feedback all welcome! This entry was posted in Camera Adventures, For Beginners, Waffle and Burbling and tagged big stopper, Christchurch, lee big stopper, long exposure, nz scenery, photography, shag rock. Bookmark the permalink. It probably isn’t easy to get away from annoying people and dogs. No not on that beach, its probably the most popular beach in the city! You have no idea how much I want to have that Lee set! I’ve also got my eye on the Singh Ray Mor Slo 20-stop ND filter but that’s around $580 for the thin version. For now I’m stuck with the cheaper ones but at least they do a good job for B&W and for color I have to do a bit more editing to get the colors back on track. Great shots! From what I’ve heard others tend to say the hard grads are better/easier to use than the soft grads. The hard grads don’t give you a light/dark line like you think they would because the light gradually shifts between the light and dark areas of the filter. I’ve also heard it’s very difficult to see where that transition occurs when looking through the lens when using the soft grads which makes it much more difficult. Another thing to think about is when taking photos of the sun when it is at the horizon that the traditional grad filters don’t work as well because the brightest part will be in the middle of the frame. For this I would look into getting a reverse grad filter. So far I’ve only worked with the screw in filters and would like to know if it would speed up the workflow or have no compact if I was working with the Lee type filters instead. As far as impact on workflow, the fiddly bit is getting the camera setup on manual mode, the filter holder clips on and off really easily, so while I have had to remove my screw on UV filter to mount the screw on Lee adaptor ring, once its on, its really easy to mount the holder and the filter, and to unclip it if you need to.